Second cousins Paul and Darla sent me a photo of this picture of our great-grandmother Sarah Lewis that they found in Darla’s mother’s (Jean Lewis) attic. I believe Hubert created it with chalk. Sarah and Hubert were married in 1885 and were together for 67 years until Hubert’s death in 1952. Image | This entry was posted in Family, The Art and tagged 19th century art, art, artist, H.R. Lewis, HR Lewis, Hubert Lewis. H. Lewis, Kim Lawler, Painting, Pastel, Pennsylvania, Sarah Lewis. Bookmark the permalink. I just noticed I also have a photo of our great-great-great grandfather Thomas Watkins, father of Mary Watkins, as well if you’d like a copy of it as well. Wow, Hazel really looked like her. Any idea when this was done? Just based on Sarah’s looks and weight there, and looking at her other photos I’m going to guess she was in her late 40s to somewhere in her 50s, I’m leaning toward 50s. She got real thin later in life, and it looks like that portrait was at the beginning of her thinning out. Thanks for asking– the question made me relook at my photos of her and I have a photo that was probably used for creating the picture. Unfortunately the only date I found on the photos I have of Sarah was one dated 1900, when she would have been 33. Thomas Watkins (lived to 102) married Mary Baptist who bore Mary Margaret (another account has middle name as Ann rather than Margaret) Watkins(christened 12/8/1850, died 1907). If the above John is your great-grandfather then we are related, but I’d have to really sit down and chart it out to figure what level of cousins we are. if you have additional information to add, I’d love to see it. 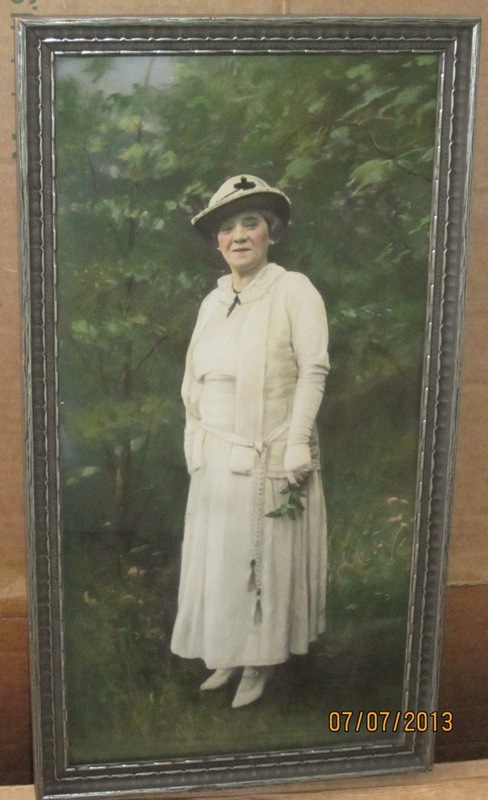 I do have a photo of Mary (Margaret or Ann) Watkins, who was our shared great-great grandmother. Let me know if you’d like me to send you a copy via email. Yes I would love that..I had seen one of here and still have a photo of John..wow..for some reason the Benjamin brothers did not get along so I don’t have any connections though I heard about a relative who did the genology long before computers..I hope to go to Wales see where our family was from..I thought Mary was from there as well..I believe her husband our great great grand father was born in Wales but not sure..I know John and Sarah along with five other sibblings were born here..thanks so much! I have art pieces as well and never understood who they were from only that we were related..